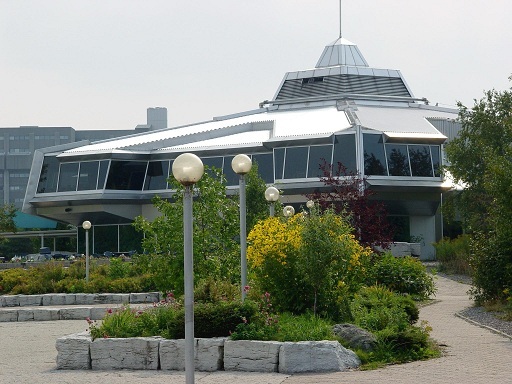 Situated on a hilltop in the city of Sudbury and overlooking the crystalline waters of Lake Ramsey is Northern Ontario’s most popular tourist attraction, and a world leader in science communication – Science North. Inside is a world of scientific learning opportunities: an extensive exhibit program, science camps, daytime and overnight science workshops and world-renowned guest speakers. Science North creates high quality science education and entertainment experiences for its visitors. These experiences involve everyday people and the relationships between science and technology and everyday life. At Science North visitors are encouraged to use various tools and experience the joy of independent learning. The Science North style has become famous for its visitor-friendly approach, which creates an environment that highlights learning over teaching. The Sudbury Arena is the fifth largest in Ontario and a popular venue for local events and entertainment acts. It is also home to the Sudbury Wolves hockey team. (240 Elgin Street. 705-675-7595). The Sudbury Theatre Centre is one of Canada’s most successful professional regional theatres. The 297-seat theatre stages a series of live professional productions from September to May. (170 Shaughnessy St. 705-674-8381). La Galerie du Nouvel Ontario is a Francophone artist-run gall;ery which presents local contemporary and explorative art as well as high quality touring exhibitions. Open Wed – Sat, 12pm-5pm at 132 Durham Street (705-673-4927). N’Swakamok Shop is operated by the N’Swakamok Native Friendship Centre and features consignment art and crafts by local native artists. Open Sept-June, Mon-Fri,10-5 at 110 Elm Street (705-674-4252). Sudbury Paint and Custom Framing has consignment artwork and exhibitions by local artists including Bruno Cavallo, a renowned student of the Group of Seven who maintained a studio at the store. 168 Elgin Street, (705-675-7493). The Attic is operated by the Sudbury Crafts and Arts Foundation. Original crafts and artworks from fashion to pottery. Monthly arts and crafts exhibitions. Open Mon.-Wed and Sat. 10-5.30, Thurs. and Fri.10-9. At the City Centre mall, 2nd Floor (705-673-5141). Sudbury Public Library – Reference Library hosts the Mary C. Schantz Room with historical photographs, maps and telephone books and directories dating back to 1910. There are microfilm records of the Sudbury Journal and Sudbury Star dating back to 1891. Open Wed.-Sat. 9-5; Tues. 9-9. At Tom Davies Square, 200 Brady Street (705-673-1155). Centre Franco-Ontarien de Folklore is internationally known thanks to Father Lemieux and his works on Franco-Ontarian culture. There is an impressive collection of tools, household implements and musical instruments used by the first settlers of the area. The Library boasts the largest collection of Franco-Ontarian historical books and traditional songs, tales and legends in the world. Open weekdays 9-4, sat and Sun by appointment. Call ahead for personal tours. 38 Xavier St. off St. Anne’s Rd. (705-675 8986). The Canadian Pacific Railway Station recalls Sudbury’s first employer dating back to 1893. Railroad crews laying the CPR tracks discovered the nickel. The present location was constructed in 1907 and has served as the gateway to Sudbury and northern Ontario. 233 Elgin Street. Church of the Epiphany. In 1911 W.Gowan Gillmor, Sudbury’s first Anglican missionary, purchased land from the CPR to build a church for his congregation. Though the original Gothic style church was destroyed by fire, it has been reconstructed to emulate the original turn-of-the-century design. 85 Larch Street. D’Youville Orphanage was originally built as a French separate school in 1894 and has later served the needs of the community as an orphanage. The building now houses the Centre franco-ontarien de folklore. 38 Xavier St.
Memorial Park, in 1917 a municipal board was established to remedy Sudbury’s lack of parkland. The boards first act was to acquire a 4 acre parcel from the CPR that would become Memorial Park, now the site of numerous community festivals and events. Old City Hall was built in 1913 and served as the City Hall for Sudbury for over 35 years. 83 Cedar St.
Ste. Anne’s Rectory. Father Nolin, a Jesuit Missionary, built the rectory in 1892 amongst a stand of red and white pines near what is know today as Durham St North. It was bricked over and enlarged in 1890 and remains as one of Sudbury’s oldest buildings. 6 Beech Street. North Bay and area is a splendour of scenery and attractions. North Bay welcomes everyone to come see the many attractions that are hosted by this area. For starters, how about a five star attraction? The Dionne Museum features the five biggest stars of the world from the 1930s, the Dionne Quintuplets, along with all kinds of other fascinating historical exhibits, displays and artifacts. Plus there’s a Travel Information Centre right next door to fill you in on everything from room prices to pizza slices. Next (or perhaps first) you must visit the North Bay Waterfront. Ah, the waterfront! Here you can stroll along the shore of Lake Nipissing or relax on the beach. Listen to a free concert regularly put on during the summer by local musicians. Prefer to get moving? Then bike or rollerblade on the new Kate Pace Way, named after North Bay’s gold medal-winning downhill skier. You may even see Kate! Take a ride on the Heritage Railway Company’s Mini-Train. The 24 passenger train takes you on a 2.5km ride along the city’s waterfront. North Bay’s Waterfront is home to special events including Canada Day Celebrations on July 1 and the Heritage Festival and Airshow on the Civic Holiday Weekend in early August. It’s at the waterfront that you’ll also find the Chief Commanda II, a twin-hull boat that offers a choice of cruises on picturesque Lake Nipissing or the Chief Commanda I restaurant which offers you a great sunset setting while you enjoy a sumptuous dinner. The Capitol Centre offers only the very best in world wide acts, performances, and exhibits. Be sure to keep an eye on their performance calendar which offers you a wide variety of options, whether your interest lies in Broadway productions, today’s top recording stars, something for the kids, or all-time favorite holiday fare. The W.K.P. Kennedy Gallery is the perfect exhibit gallery for those who enjoy various forms of art. Located in the heart of the city, the Capitol Centre is sure to be on your list of “must see” attractions in the city. A new attraction is quickly growing in North Bay and tickets are selling out fast. With the advent of the Nipissing Stage Company, summer theatre has taken off locally as an ideal evening entertainment. And there are so many more things for you to experience and exlore in North Bay. Not the least of which is hiking up the trails from Duchesnay Falls to the College Education Centre, home to Canadore College and Nipissing University. For those who prefer to enjoy the sights and history of the area without the task of finding their way around, there are many outdoor tour groups to provide you with competent guides and comfortable transportation as they lead you on a historical tour of the area. The North Bay Area Museum features a wide range of exhibits on local history as well as special exhibitions from the Royal Ontario Museum and other national and provincial museums.